Fast action pass shooting with a European flair. 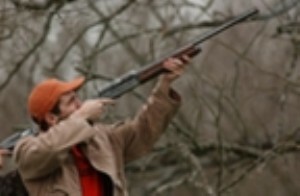 That is what Poplar Springs Farm Hunting Preserve offers the discriminating shot gunner. Pheasants are released from a wooded, hidden area. The birds climb to treetop height and streak across the sky in all directions. There are 20 shooting stations that rotate in a circle so everyone has a fair chance to harvest a large quantity of birds. Two to four boxes of shells per shooter are recommended. 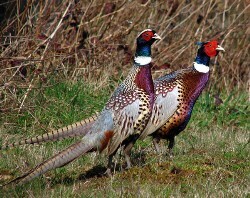 This European style pheasant shoot is a perfect activity for corporate outings or fundraisers. All birds are breasted and divided equally among the shooters. A large country style lunch or dinner follows the shoot. We recommend a full choke and #6 shot shells. No 3-3 ½ inch shells. Safety goggles or glasses, blaze orange hat and vest are required. Bring a cooler to take birds home. The first 6 shooters paying a $100 clean up fee can return after lunch to the tower area to hunt the pheasants that were not taken. Shooting starts at 9:00 am. Please arrive no later than 8:30. After the shoot, a lunchtime meal is served. To book your European style tower shoot call Poplar Springs Farm Hunting Preserve at 704-860-3396. We look forward to hosting you and your group.